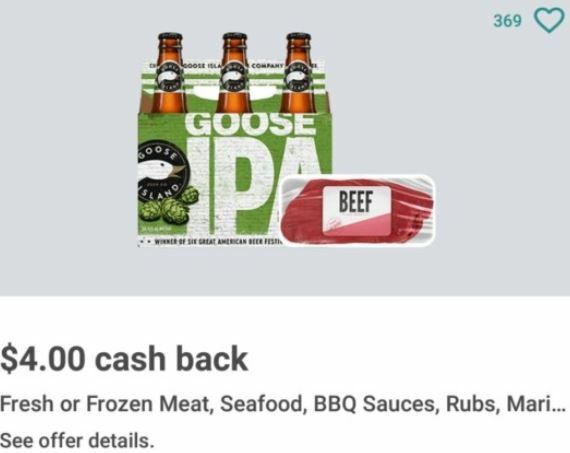 Don’t be fooled by the beer in the picture – you can get $4 cash back on fresh or frozen meat, seafood, BBQ sauces, Rubs, Marinades or Seasonings. The value of purchase must exceed $4.00, however this should make for almost FREE meat. Rebate valid at Walmart and more retailers, check your Ibotta app under Meat & Seafood. Rebate expires 12/31/17. Select States Only* AL, AR, CT, HI, KY, MA, ME, MN, MO, NC, ND, NJ, PA, RI, UT & WV only. You might find yourself frustrated with the number of Ibotta rebates that show an alcohol item with another item for rebate. But you need to look closer at these! They are what we call “No Beer Purchase Required” Rebates. Meaning that you do not have to purchase the beer – just the other item in the rebate! Some states have laws against alcohol companies offering rebates on alcoholic beverages. So, if you live in one of the 14 states that have these laws, a lot of times you can still get the rebate just by purchasing the listed product(s)! The states are AL, AR, CT, HI, KY, ME, MD, MO, NC, NJ, NY, OK, UT and WV. When No Beer Purchase is Required, we call these NBPR rebates. To us “old” couponers the concept is not new. Back in the day you just had to look out for the printed rebate forms near beer displays and mail them in. But I haven’t seen one of those in YEARS. It looks like Ibotta is reviving the concept! So if you see a product you want to purchase paired with Budweiser (or another alcoholic beverage – don’t discredit it! Click on the offer and look for the [NO BEER PURCHASE REQUIRED] statement. If you look at the screenshot above you can clearly see them! Have you noticed the No Beer Purchase requirement on these rebates? Have you redeemed any of them? Next post: Amazon Prime Members: Purina Cat Food Sample Box FREE after credit!